It’s Facebook Friday — each week we’ll offer one tip for leveraging Facebook to increase customer awareness of and engagement with your brand or business. This week we’ll go over the basic sections and functions of the new Admin Panel for Facebook Pages that have been switched over to Timeline. What Is an API & Why Does It Matter? Still haven’t make the switch to Timeline yet? Facebook has mandated that by March 30, you’ll have to. We have a guide to preparing for the switch to Facebook Timeline, and we also have a guide that shows you how to switch your Facebook Page to Facebook Timeline. Check those out before reviewing this tip, because the Admin Panel we’re discussing won’t appear until you’ve made the switch to Timeline. To view your Admin Panel, just visit your Facebook Page while logged into an account that has administrative access to that Page. Alternatively, you can click on the drop-down arrow in the top-right corner of Facebook and choose the name of your Page from the “Use Facebook as” list. That will take you straight to your Page. This Admin Panel is broken into 5 sections. Each of those provides useful information in an easy-to-reach place — at the top of your Page. Only you and other administrators assigned to your Page can see this. Some of these features — like the “New Likes” section — are completely new additions with Timeline. Notifications. This is a news feed of the most recent activity on your Page, from people commenting on your updates to posting to your Timeline. This operates the same way as the globe icon in the top-left corner of Facebook (by Messages and the search box) does for personal profiles. Messages. Pages can now send and receive private Messages just like personal profiles. Your inbox of recent Messages appears in this panel. New Likes. This is an easy place to see the most recent people who’ve liked your Page. This is a hugely useful addition, because it means you can track who’s Liked the Page, and thus offer incentives or special attention to those who do. Insights. This panel houses Facebook Insights, the metrics-tracking tool that lets you keep an eye on the reach of your updates, how people are engaging with you, and more. This panel in itself is not very useful, but if you click “See All” it will take you to the more detailed Facebook Insights application. Page Tips. Facebook rotates useful tips for managing your Page here. Click the “Next” button to see more of them. Additionally, there are some down-drop menu options at the top of the Admin Panel. This is where you’ll want to get started with more in-depth Page management. Here’s a quick summary of what’s available. Manage. From here you can click “Edit Page” to access the advanced control panel for your Page, which lets you do things like manage apps and administrators. 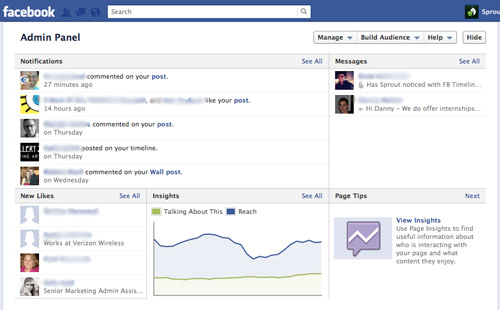 “Use Activity Log” gives you a comprehensive history of things that have changed or been interacted with on your Page. “See Banned Users” does just what it sounds like. If you’re not logged in as your Page, you’ll also be given an option to log in as the Page for commenting purposes here (instead of your personal profile). Build Audience. Here you can take actions that may attract new people to Like and engage with your Page. For example, you can invite your email contacts or personal profile Facebook friends to visit and Like the Page, share the Page to your own Timeline and your friends’ News Feeds, or create and pay for Facebook advertising for the Page. Help. This is your gateway for customer support from Facebook. You can visit the Help Center, which is a database of helpful articles, take a guided tour of the features of Facebook Pages, take a video course on Pages, and view Facebook’s detailed “product guide” white paper that explains all the features and elements of a Facebook Page. You can also send feedback to Facebook’s customer support team. Hide. This button hides the admin panel, giving you just a few of your Page’s Timeline. You can restore the Admin Panel by clicking the “Admin Panel” button in the right-side panel, above the list of years for your Timeline. All these tools help you manage your Facebook Page, and Timeline’s new Admin Panel interface makes it easier to access them before. You can also generate gorgeous metrics reports, schedule updates, and more using Sprout Social, our social media management tools. Was this tip helpful? Do you have any more ideas for getting the most out of Facebook? Let us know in the comments!